$1,000 Cash prizes Each Week! Sienna elves will carefully review each post and select the TWO merriest of the week. Winners will be published each Thursday on this page and on the Sienna Plantation Facebook Page. Winners will pick up their cash at the Sienna Plantation Homefinder Center Mon-Fri, 8:30 a.m. - 5:30 p.m.
Taylor Morrison 60', 70', 80' 4822 Avalon Plantation Dr.
POST DIDN'T WIN? NO-HO-HO WORRIES - YOU CAN TRY AGAIN EVERY WEEK! HO! HO! HO! Didn't win this week? Try again! Game starts over today. Thank you for visiting Sienna Plantation. Drive around a bit! There's so much to see - and do. Year-round! 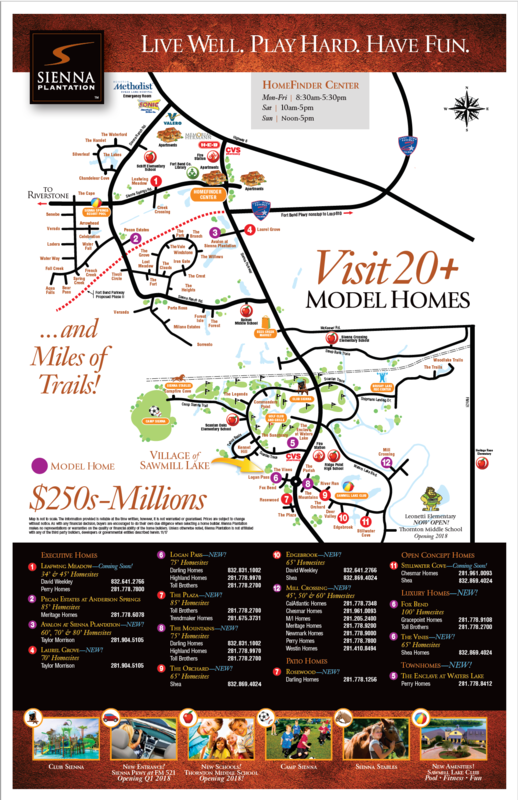 Visit any model home or our Homefinder Center for details on the home that is right for you. Photos posted between Friday, November 23, 2018 - Monday, December 31, 2018 are eligible. Selfie must be taken in any model home in Sienna Plantation, Missouri City, Texas and posted to Facebook.com/SiennaPlantation. Two winning posts will be selected each week. Winner must be 18 years or older. All decisions final. Winners will be announced on the Sienna Plantation Facebook page and published each Thursday at siennaplantation.com/siennaclaus. 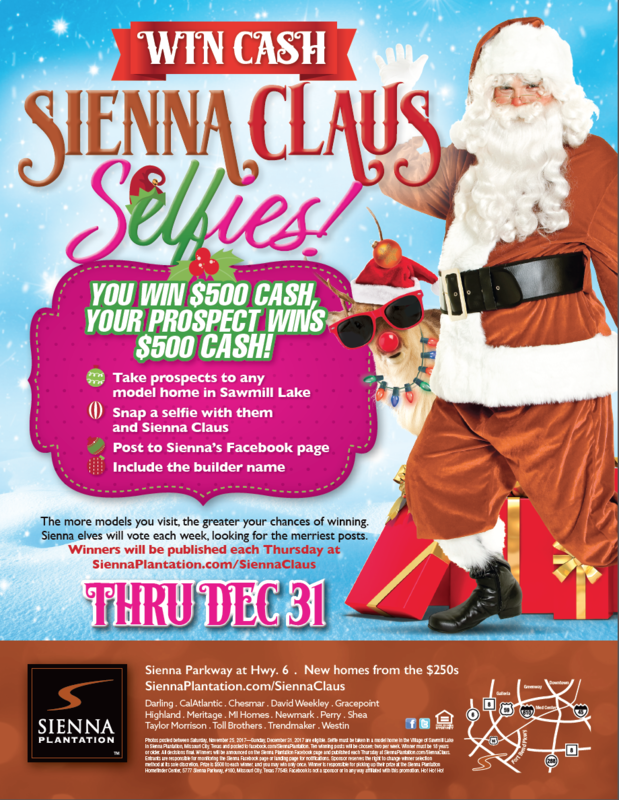 Entrants are responsible for monitoring the Sienna Facebook page or landing page for notifications. Sponsor reserves the right to change winner selection method at its sole discretion. Prize is $500 to each winner, and you may win only once. Winner is responsible for picking up their prize at the Sienna Plantation Homefinder Center during business hours, 5777 Sienna Parkway, #100, Missouri City, Texas 77549. Facebook is not a sponsor or in any way affiliated with this promotion. Ho! Ho! Ho!